The map above shows distributions of housing types in the pre-contact eras. The ranges of types were hypothesized by anthros based on archaeological sites, ethnographic data (both visual observations of housing and explanations by Native people). In the table below, each row shows house types that are related to one another. Each type will be connected to a short illustrated essay and links for similar types of native housing, with photos, construction and current tribal cultural info. It's recommended you scroll past the table and read the "why " of this section before looking up the archaic housing types. for your little classroom tabletop village. What the 3 in the first row below have in common is that each of them has become a styereotype of Native housing . For some time, I've been annoyed by a steady trickle of requests from (non-Indian) parents, students and middle school teachers seeking info for projects that involve making simple archaic toy-model houses. I see many books for kids that take this approach to teaching our history and culture. That approach portrays us as quaint and primitive, usually (today) without using those words. And of course we're supposedly long gone from this world. Ignored are real horrible Native housing situations, and real positive developments such as Indian architects and builders who are influenced by traditional values and forms, to create imaginative designs with new materials. And, as old forms of housing do survive, their functions and meanings are as "homes for the spirit." something that does not lend itself to toy "tabletop model Indian villages" created by non-Indian children. The entire activity for non-Indian youngsters is like those sorry dressup games which suggest that Indian identity is merely a costume, with paper feathers and paper bags playing a role in sleazo imitation garments. However sleazy or fine, Indian identity is taught as a costume or role to be put on, then taken off. Thus this section on Native housing. is being developed as a partial corrective. The photo on the right -- a toy "tepee" cut from a blanket by the two white children (or the book's authors) -- is from a book expensively prepared in London, marketed in Britain, Canada, and the U.S. which takes this highly undesirable approach to presenting our history and culture by having non-Indian children manufacture these inaccurate, usually ugly fakes -- from houses to costumes to "art" such as paper eagle feathers. The book of fake-craft is Make it Work: North American Indians -- the Hands-on Approach to History. It's one of the most offensive cultural education books I've ever seen, not the least because of the great expense with which it was produced -- all color photos, many children (no Indians of course), photographed in London, prepared entirely by arrogant and ignorant Brits, but quickly picked up also by Thomson Learning in the U.S. I find this approach -- trash crafts, the fakery of "costumes" and junk toy models -- so dominant in non-Indian schools' approaches to Indian history/culture in schoolbooks and on websites touting expertise in teaching about "minorities" that these pages are a counter-attempt. I will show both real cultural-historical-environmental meanings of traditional dwellings, and both the negative (which is still the majority) and the positive new aspects of present-day Native housing and buildings. "The poorest-quality housing in the United States is that occupied by American Indians and Alaska Natives living in reservations and other tribal areas. Such dilapidated housing might not be of concern if a commonly held myth was accurate; namely that tribal-area populations are dwindling as their inhabitants move to the cities in search of higher incomes. A new study, however, exposes the fallacy of this belief--people are leaving the reservations to secure employment, but many of them are moving to areas just outside their borders. . . . a more equitable and efficient method of distributing federal resources should be developed at a time when the housing deficiencies of many Native American families remain the most severe in the nation." Reading the whole essay is highly recommended to all those elementary teachers who are assigning those "Build a tipi from a paper cone" activities. Exploration of CodeTalk, produced by ONAP's Indian employees, is highly recommended as an excellent source for current developments in Indian life and culture today, as well as housing policies and pix. A site of real and virtual (computer-generated) solar architecture projects with heavy emphasis on Native American influences, designs, and uses, by New Mexico solar architect Dennis Holloway. Especially interesting is the project by Holloway and Navajo archaeologist Dr. Charles Cambridge that built 3 demonstration solar hogans on the University of Colorado campus (Boulder). This page from HUD's Office of Native American Programs website CodeTalk describes 1995 Native Cultural Design housing and facilities prizewinners. Most of these projects apply traditional housing concepts to modern life, whether for energy-efficiency or to create the the social solidarity of Inuit villages, where everyone helped one another to survive. Douglas Cardinal, Blackfoot from Alberta, Canada, is one of the most interesting arcitects today. He uses new materials with traditional design concepts, and develops his building designs with one of the earliest architectural firms' uses of computers. His largest, most famous design project is the Canadian Museum of Civilization, whose campus is pictured here, which has a large Native section. In a write-up about the architect that the museum posts, they mention his birth and early life, but they do not mention his Indian ancestry, or that his earliest project was a church in Red Deer for Reserve people. The CMCC thus contributes to the notion that Indians are either gone or scattered survivors irrelevant to today's world except for entertainment visits to museums, where you can see plastic dummies in dioramas and collections of glass-cased loot. Someone (of course) has already asked "What's wrong with having our (non-Indian kids) play dressup and make these little play-toys?" A long, thoughtful answer to this question is in several essays in the (currently) out of print book that is still in many libraries: Through Indian Eyes: The Native Experience in Books for Children. The bottom line is that Indian identity isn't a play-role. Our Indian kids who help make outfits for powwows (and other items) learn authentic methods, and will proudly wear these items in authentic community events. It is part of their lives, not a play-time time-out from life. Though TIE is unfortuntately recently out of print, still available from Oyate (a Native group in Berkeley) is How to Tell the Difference: A Guide to Evaluating Children's Books for Anti-Indian Bias. This is only about books, not dressup and toys or trashcraft. The authors automatically downcheck books where non-native children are shown "playing Indian." The reasons for this (explained in the longer work) are valid, and connect to the group's analysis that relates to avoiding the teaching of stereotypes or teaching a kind of ancient past view (usually distorted), but in any event frozen in the long-ago, unconnected to the present. The Native group -- teachers, librarians, parents, artists, intellectuals -- supports a criterion that "The continuity of cultures [should be] represented, with values, religions, morals, an outgrowth of the past and connected to the present." The guidebook is highly recommended for elementary and Middle school teachers or parents. Oyate: 510/848-6700. Text, maps and graphics copyright -- Paula Giese, 1996. except where elsewhere attributed. CREDITS:Maps adapted from Harold E. Driver, Indians of North America, 2nd Ed., Univrsity of Chicago Press, 1876. Maps were prepared by Driver and and William C. Massey in the 1950's and '60's (one of the first big GIS projects) that put together all known data both ethnographic (interviews) and archaeological to define map-absed culture areas, common subsitence features, tribal territories. The typical house types icons are adapted from Driver and Massey. 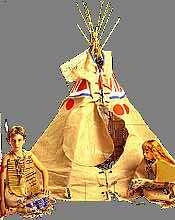 The photo of children in trash-costume, sitting outside a toy tipi are from the book mentioned in the adjacent text.